© photos from my testers! 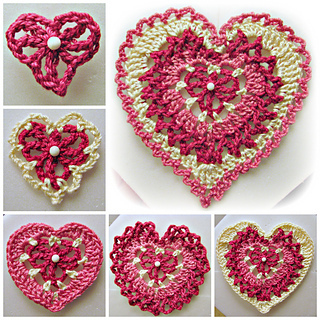 This unique design creates 4 different sizes of heart ornaments, decorations, or appliques, simply by ending at any of the 4 noted rounds. You may fasten off and change color at the end of every round if desired. Last page of pattern includes photos after every rnd. Make in worsted weight cotton yarn for a special face wash cloth, or whip stitch 2 together around the edges or work last round through both layers for a pretty hot pad. 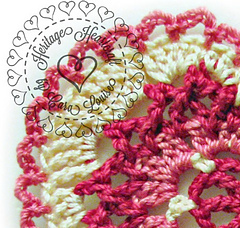 Fasten a special bead or button in the very center to create a special Valentine’s Day decoration or to show love to someone any time of year! 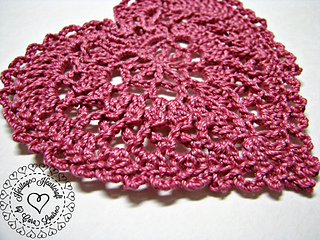 Small Heart, just under 2 ¼ inches wide. 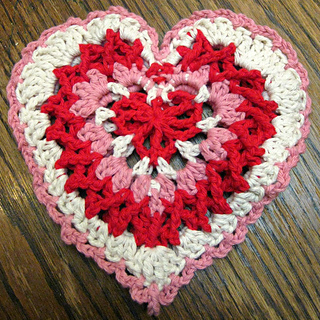 Medium Heart, about 3 inches wide. 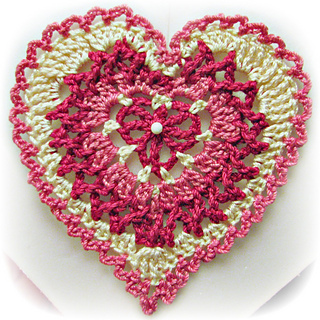 Large Heart, just over 4 inches wide. yarn or thread size of your choice and appropriate hook size to match. 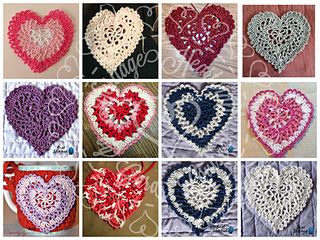 Large heart will be about 3 inches with size 10 thread, and about 6 inches with worsted weight yarn.